“Find something that you can be passionate about and learn it well,” advised Mariano-Florentino Cuéllar M.A. ’96 Ph.D. ’00, the co-director of the Center for International Security and Cooperation (CISAC). Cuéllar’s illustrious career, ranging from Stanford to the White House, could be characterized by exactly that tenet: deep and intense study of the nation’s most pressing policy issues. At an early age, Cuéllar– who will become the director of the Freeman Spogli Institute for International Studies (FSI) in July– sought to become “the kind of citizen who would be involved in civic affairs.” Cuéllar said that growing up along the U.S.-Mexico border had a profound influence on his understanding of the world and prompted his desire to study politics and governance. “When you grow up on the border, you realize that a legal demarcation has such a huge effect in distinguishing one country from another, for example, and the whole structure of law shapes who’s a citizen and therefore who counts in one society or another,” he said. Around the time he entered junior high school, Cuéllar moved to Calexico, Calif., in the Imperial Valley. Encouraged by teachers and his parents to pursue higher education, Cuéllar enrolled at Harvard University as an undergraduate, studying government and political psychology. To Cuéllar, “the world seemed limitless,” even as his interest in law intensified. Cuéllar went on to pursue an unusual set of degrees, earning his J.D. from Yale Law School and master’s and doctoral degrees from Stanford. Before completing his Ph.D., Cuéllar took so me time off to work at the Treasury Department, where he was a senior advisor to the Under Secretary for Enforcement. He described the experience as a formative part of his early career. Cuéllar said that he has since sought to combine teaching and academic research with a role in policy making. After leaving the Treasury Department and finishing his Ph.D., he went on to work at the U.S. Court of Appeals for the Ninth Circuit, before finally coming back to Stanford in 2001 as a tenure-track professor at the Law School. 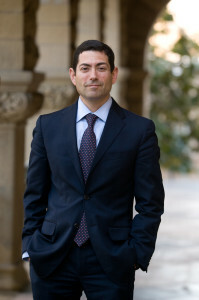 In 2009, however, Cuéllar left Stanford to work on President Barack Obama’s Domestic Policy Council at the White House, where he remained until July of 2010. Melody Barnes, Obama’s former Director of Domestic Policy, hired Cuéllar after witnessing his work on Obama’s campaign team. According to Barnes, Cuéllar worked on a variety of policy issues, including spearheading a process to reform the food safety system. Bob Kocher– who worked in the Obama White House on the National Economic Council– collaborated with Cuéllar on several issues, including Food and Drug Administration regulation and transparency, the Department of Agriculture and world economic policy. Cuéllar, Kocher said, was also a key player in immigration reform. Cuéllar returned to Stanford in 2010. In 2011 he became co-director of CISAC, one of 11 research centers housed under FSI. He will transition into his new position as director of the entire institute in July of this year. Barnes said that Cuéllar’s policy experience makes him an extraordinary asset to Stanford. According to Kocher, Cuéllar is a global thinker, a strength that combines well with his influential position at FSI. Cuéllar said that his advice to Stanford students who aspire to follow in his footsteps is simple: never underestimate the power of knowledge. Cuéllar said he is greatly excited by the capacity of FSI to help address these problems.